As a Certified Public Accountant (CPA), you have an obligation to your clients — even if they are facing tax issues with the IRS. You may be able to guide them through the process up until your client faces criminal charges for back tax debt. At this point, you have to make a decision between investing time and money into helping them deal with the IRS and the courts, or give a national tax consultant and advisor a call to help review and analyze the situation. Jeffrey Anton Collins, a tax relief consultant, serves the entire nation as one of the premier tax advisors for CPAs and their clients. If you’re a CPA with a client facing tax debt greater than $100,000, it’s time to give Collins a call. As a CPA, you’re well-versed in tax knowledge. You organize, file, report, and amend taxes for your clients, either as individuals or business entities. What’s more, you advise your clients on how to prepare and file their taxes to get the largest return and reduce liability. However, when they face IRS charges on back taxes exceeding $100,000, the approach and decision-making process must change from simply amending taxes to defending the client. As a bar-certified, civil and criminal tax lawyer, Jeffrey Anton Collins provides years worth of experience in tax law, as well as court proceedings that involve tax charges. He is licensed to practice before the U.S. Tax Court, and he is a tax authority on U.S. Tax Code and IRS procedure. What’s more, Mr. Collins has worked as a CPA and within the IRS, so he’s versed in the language, processes, and procedures. Read Jeffrey Anton Collins’ client testimonials and bio page to learn more. The primary difference between a CPA and a Tax Attorney is the knowledge and experience to represent a client in court proceedings. 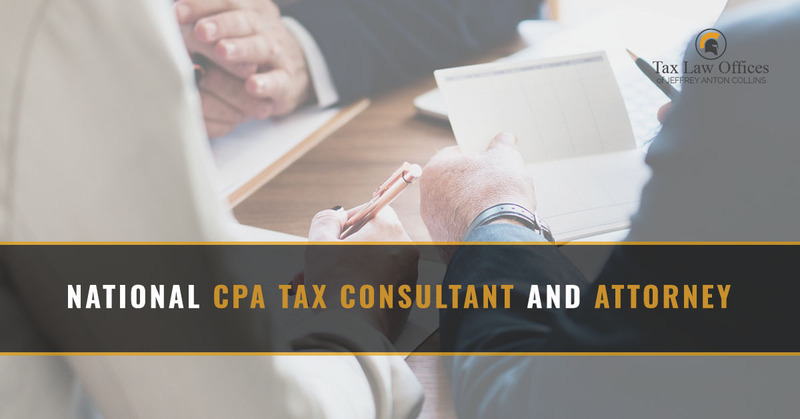 A CPA is authorized to represent a client in IRS disputes, but when it comes to IRS charges and court proceedings, an experienced, knowledgeable tax lawyer is needed. Jeffrey Anton Collins will work with you as your client’s CPA to determine the best strategy to use. With more than $100,000 in tax debt, the IRS will be utilizing its full force to collect on your client’s owed taxes. Mr. Collins joins forces with you to examine, analyze, and address your client’s tax history, as well as how to move forward with the IRS and court proceedings. If your client is facing possible criminal charges from the IRS, Jeffrey Anton Collins is certified and experienced in representing clients to reduce charges and liability. A huge benefit to utilizing a tax lawyer is confidentiality. Your client is not protected sharing information with you. In fact, you may be called to the stand to testify against your client. As a certified tax attorney, Mr. Collins protects the client under lawyer-client confidentiality. As an unwilling participant, the CPA avoids dire legal consequences surrounding the mishandling or misreporting of a client’s tax information to the accountant; and the filing of said tax information to the IRS. The CPA is not responsible for knowing the hidden legal pitfalls within the criminal tax laws. The CPA can avoid the great exposure of professional malpractice. If your client is facing potential criminal charges brought against them, you owe it to them to bring an experienced tax attorney into the conversation. Large tax debt, tax audits, and indictments do not simply go away; they must be handled with the utmost focus and seriousness, as well as in a timely manner. Not taking the IRS seriously can result in a mountain of fees, penalties, and, in some cases, jail time. Your client’s future relies on you introducing them to an experienced, knowledgeable tax lawyer. Give Jeffrey Anton Collins a call today to start the conversation. You owe it to yourself to use the best defense available to avoid punishment that could have a far-reaching impact on your life, your family, and your business. Contact taxation attorney Jeffrey Collins today to set up a free initial Strategy Meeting.